Why impose on a friend or rely on a untrained pet sitter to take care of your pets while you’re on vacation, out of town for business, or simply gone for the day? River Trail Animal Hospital’s Pet Lodge offers your dog or cat a safe, comfortable and fun place to stay. 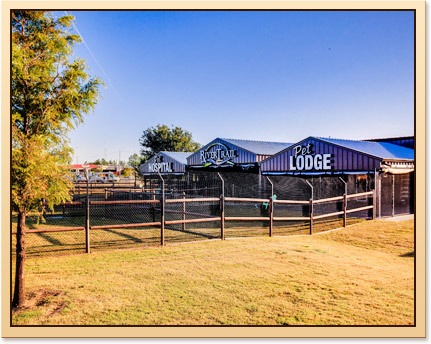 Our climate-controlled Tulsa County pet lodging and doggie daycare facility is founded on the concept that providing the best and safest experience for your pet does not require cages. All our indoor, individual pet boarding dog rooms have glass doors, and our days are filled with plenty of activities for our guests. 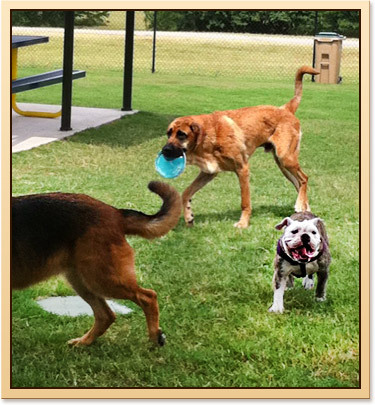 For dogs, this includes lots of outside time engaged in group play—upon client approval—in our large play yard overlooking the Arkansas River. Cats will love staying with us because we have a special play area for them located at the front of our hospital, ensuring your favorite feline will have plenty of interesting things to watch throughout a day spent relaxing comfortably. We allow pets to bring their own food and a toy or two from home to make them feel more at home. We are also happy to offer our guests Science Diet Sensitive Stomach and provide comfortable bedding. We prefer you to make a reservation, especially around the holidays and weekends. We require your pet be up to date on all annual pet vaccines, including Bordetella for dogs, and that your pet be on parasite prevention. The hours of our Tulsa and Bixby pet boarding/lodging facilities are the same as the animal hospital. Dog/cat boarding kennel pickup and drop off on Sunday from 4:00 to 6:00 PM is also available. Call us to book your pets' boarding vacation in Tulsa today!